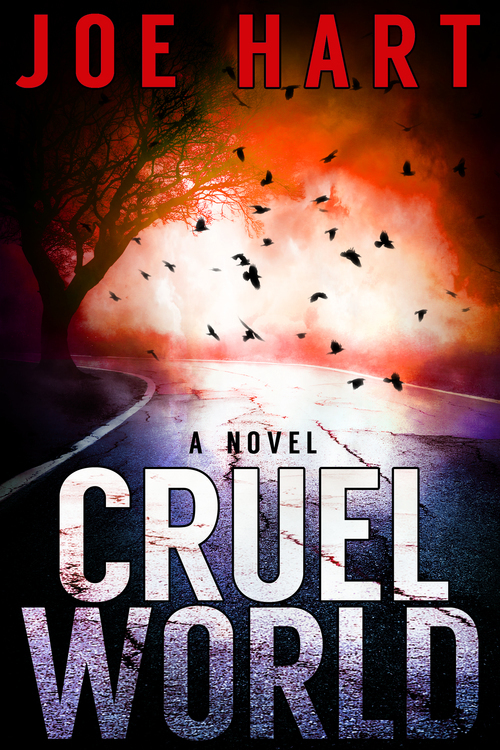 Cruel World by Joe Hart is post-apocalyptic horror done right. “Hidden away from the world by his famous father, Quinn Kelly strives to find meaning in his life while struggling with a deformity that has kept him from leaving the only home he has ever known. On the eve of his departure a sudden and deadly virus sweeps across the nation, killing nearly all it touches. Within days Quinn is left to fend for himself in an empty world. Now, this is the stuff. This is how a post-apocalyptic novel should be written. I wasn’t ten pages into Joe Hart’s Cruel World before I decided I was going to love this book. Nothing about the remaining 300+ pages changed my mind. Dripping with imagery, Cruel World succeeds, where so many would-be challengers to The Stand’s post-apocalyptic throne, fail. Cruel World opens in New England, where disfigured Quinn Kelly struggles with a coming-of-age choice: does he remain in the safety of his home around the one’s who love and accept him, or does he become his own person and venture into the cruel world, where he will be derided for his physical appearance. Enter a pandemic-type influenza outbreak which decimates the world’s population, leaving him frightened and alone in the only home he has ever known. Or at least he thinks he is alone. Unexplained sounds emanate from the woods, and something huge and terrible is glimpsed through the trees. Walls can no longer protect him from this cruel world, and he is forced to flee with a beautiful stranger and her blind son if they are to stay alive. The sense of emptiness and limitless possibilities are what I love most about good post-apocalyptic novels. Hart nails these aspects, allowing you to immerse yourself in familiar settings before unleashing the monsters. Joe Hart’s characters are rich and nuanced, performing actions which match their motivations. Cruel World will ultimately be compared to Stephen King’s The Stand. This inevitability is faced by all authors of post-apocalyptic horror, including yours truly. Besides the pandemic outbreak, there are far more differences than similarities between Cruel World and Stephen King’s masterpiece. I will avoid specifics so as not to spoil the story for you. But something about the monsters inhabiting the post-apocalyptic world made me think of Lost and Cloverfield. Whether or not they do the same for you, I think you will love this creative twist. You’ll never hear the word stilt without shuddering ever again. I give Joe Hart’s Cruel World my highest recommendation. If you are fan of horror, and especially if you love post-apocalyptic adventures, this is the story for you.